This Superior Shed was installed in our customer’s garden in Kendal to store gardening equipment. 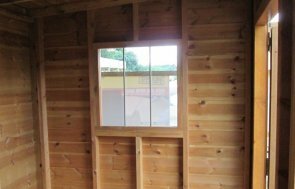 Our dedicated team delivered and installed it, as with all of our luxury Garden Sheds. This particular shed is lined with heavy duty felt for long lasting weather protection. The natural look of the timber is retained with a coating of our standard Light Oak Preservative, which wards off fungi and woodworm. Practicality was key with this shed, with double doors which help our customer move large tools. Finally, this customer's tools are protected with our security pack. This consists of a seven lever lock and heavy duty sliding bolt, security screws for the door hinges, and stainless steel window bars. If you are interested in a luxury Garden Building, we invite you to visit one of our seven UK Show Centres. If you have any queries you can raise these when at a Crane's show centre - there's always plenty of approachable staff members that'll answer any questions you may have. Need some extra storage space for your gardening equipment? 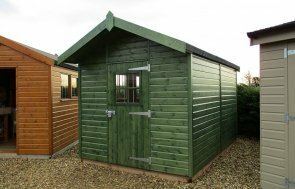 Click the link below to find your ideal garden shed. If there's something you require that isn't included as standard let us know. All our buildings are hand-made to order so we can easily meet your needs.